I am shocked at how little mention is being made of the fact that the rioters in Ferguson most likely don’t have a legitimate grievance over the police shooting that supposedly sparked all of this. We know the man who was shot had already robbed a store and assaulted someone earlier that day. It is on video for everyone to see on their own TV (or on one they have stolen). That alone should be enough to prevent any reasonable person from taking to the street on the premise the guy could not possibly have done anything warranting his being shot. It doesn’t guarantee that the shooting was good, but it does certainly mean that it is not something to get up in arms about without more information. As far as I can tell the press has made very little effort to verify much of anything in this story. You would think we would know with certainty what injuries if any the officer suffered and exactly what his story is at this point. You would think we would know with some certainty who lied about details of the shooting. While this information might be known, the fact that it is not being trumpeted indicates to me that it does not fit the preferred press narrative. I do not doubt that prosecutors have known there is no evidence of wrongdoing on the part of the cop for a long time now and have just let things drag along, perhaps in hope some of the madness will abate. This is a very bad idea since it lets a mythology grow up in place of facts and lets the vultures profit off misleading the community that much longer. By the press not presenting both sides of the story, or being in any way critical of the rioters, it is only going to fan the flames all the more when the officer is not indicted or convicted, as seems most likely at this point. In Zimmerman’s case the racists in the justice system handled that problem by prosecuting him anyway after the local authorities and grand jury were removed from the loop. This is like removing the negative feedback from a circuit and expecting it to do anything but hit the rails or amplify whatever spurious signal is input. Usually something ends up burning when this happens. With a circuit it might only be a transistor, but with justice it can be a whole community. In large part this foot dragging and reticence to tell the truth is due to the fact that it is very, very important to our DOJ and our president that America be seen as being far more racist than it actually is. It is useful to the president and his party to have this issue open for as much of the election season as possible. It does not seem an accident to me that this has occurred in a campaign year just as the Zimmerman case did. Shootings happen every day. Only certain ones are chosen to be publicized in the manner of this one. What nobody wants to say, but everyone knows, is that racism is virulent within the black community in the US, while largely being stamped out elsewhere. Yeah, there is the condescending sort practiced by liberals, but that is the worst of it and any directly negative effects of it are aimed towards whites (although the secondary effects on the attitudes of black communities and the incentives it creates are unintentionally devastating). There isn’t a single HR department in the country looking to hire fewer blacks or other minorities. In fact white racism is so comparatively rare that examples of it have to be made up. There is even a phrase for this sort of fantasy racism — it is called “dog whistle” racism supposedly because only racists can hear it… which makes a certain sort of sense given only people in the press and leftists claim to hear it. But that is of course not what the intent of the phrase is. One would think that if blacks were subjected to widespread persecution based solely on their skin color that the martyrs that are put before us would actually be innocent and that the people who harmed them would be motivated by racial animus. But this never seems to be the case in these high profile cases. OJ, Zimmerman, Ferguson… they just never pan out to fit the narrative of white oppression. Yet these are the cases around which people rally. They are the ones that are picked from what we are told are thousands upon thousands of examples as being most indicative of what often happens and yet they never seem to hold water. It is almost as if people are being cynically manipulated. And I would be greatly surprised if this case is in any way an exception to that pattern. Which brings us back to Obama. It is to his benefit to stoke racial tensions even in situations like Ferguson or the Zimmerman case where the responsible thing to do would be to simply explain what happened and make sure more victims are not created by people lying to the protestors about the nature of the events which have transpired. That would have benefited the country greatly and it would have been the right thing to do. But that would not have benefited Obama. He gets most of his support stirring up grievances, or creating them out of whole cloth, so anything which would create more harmony necessarily weakens him. And it needs to be said, that it also weakens leftism in general since it thrives off the six G’s — graft, grievance, guilt, greed, grifting and gullibility. Obama is a creature of privilege. He would have us believe that he overcame his race to get where he is, but we all know it was a huge asset to him every step of the way. It was not his only asset, but it was the key one. People aren’t supposed to point this out. But the greatest evil is always done when people fear to state forthrightly the most obvious things so let’s not mince words. Everything Obama is and everything he has was largely handed to him based on very little effort. He got into Harvard without the qualifications. He never published as the editor of the Harvard Law Review. He rarely voted as a senator. He never created any jobs as a community organizer. The Nobel Prize Committee made no bones of the fact that he was given the Peace Prize because of his race. Large parts of the electorate proudly state that they voted for him based on his race. It is impossible for a person to be more privileged than that short of divine right… and many in the press think Obama possesses even that. He thinks everyone is handed success because that is how he experienced it and for him there is no experience outside of his own. He sees more white people being successful and therefore the only way that could happen is if they are given more stuff so the obvious remedy is for him to do the opposite and give minorities more stuff — then they too will be successful in the same way Obama is. Except as we see with the statistics from the black community under Obama’s watch it doesn’t work that way. They have fallen behind by just about every metric from employment, to net worth, to income… surprising absolutely no one but Obama. The whole economy cannot be made up of grifters who produce nothing so Obama’s chosen method of success cannot be made universal. It is unique to him. So the black community in particular is made to suffer as Obama seeks to remake it into his own image. How could it be otherwise when they are being told the path to success lays through redistribution of wealth rather than its creation? How could it be otherwise when they are told they deserve everything that everyone else has regardless of what they have accomplished or what they have earned? How could it be otherwise when they are convinced that the deck is stacked against them? They never stop to think that Obama and those like him on the left are the ones who have manipulated them and who have dealt them their current hand and who see them only as a means to an end — that end being their own enrichment. So my observation about Ferguson is simply this. They need to stop rioting against the stacked deck, and start rioting against the people who have stacked it. Or better yet, stop playing the race card game altogether. There are better, surer paths to success and the people telling you otherwise do not have your best interests at heart. 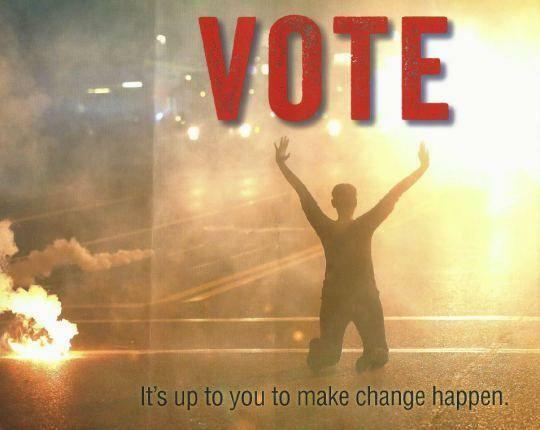 No sooner had I posted this than I found the following picture the Democrats are using to drive black turnout even though they control all of the political offices in Ferguson. Shameless is too weak a word for it.